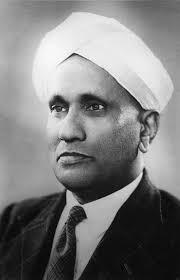 Sir Chandrasekhara Venkata Raman(November 1888 – 21 November 1970) was an Physicist of Bharat, born in the former Madras Province, whose ground breaking work in the field of light scattering earned him the 1930 Nobel Prize for Physics. He discovered that, when light traverses a transparent material, some of the deflected light changes in wavelength. This phenomenon is now called Raman scattering and is the result of the Raman effect. Raman passed his matriculation examination at the age of 11 and he passed his F.A. examination (equivalent to today’s Intermediate exam) with a scholarship at the age of 13. Love of science, enthusiasm for work and the curiosity to learn new things were natural to Raman. Nature had also given him the power of concentration and intelligence. He used to read more than what was taught in the class. When doubts arose he would set down questions like How?”, “Why?” and “Is it true” in the margin of the textbooks. At the age of 19, Raman held a high post in the Government. He was appointed as Assistant Accountant General in the Finance Department in Calcutta. One evening Raman was returning from his office in a tramcar. He saw the name plate of the “Indian Association for the Civilization of Science”. Immediately he got off the tram and went in. Dr. Amritlal Sircar was the Honorary Secretary of the Association. There were spacious room and old scientific instruments, which could be used for demonstration of experiments. Raman asked whether he could conduct research there in his spare time. Sircar gladly agreed. Raman took up a house adjoining the Association. A door was provided between his house and the laboratory. During the daytime he would attend his office and carry out his duties. His mornings and nights were devoted to research. Raman was appointed as Professor in Science College of Calcutta. He sacrificed the Government job which gave him good salary. Raman was deeply interested in musical instruments. Sir C. V. Raman had proved that plant growth can be positively influenced by music, as the plants have life. Smilarly cows and buffaloes yielded more milk when music was played. discovery of the Raman effect”. He was the first Asian and first non-white to receive any Nobel Prize in the sciences. Before him Rabindranath Tagore had received the Nobel Prize for Literature in 1913. Raman and Suri Bhagavantam discovered the quantum photon spin in 1932, which further confirmed the quantum nature of light.During his tenure at IISc, he recruited the then talented electrical engineering student, G. N. Ramachandran, who later was a distinguished X-ray crystallographer. This entry was posted in Biosketch, Sciences and tagged Chandra Shekara Venkat Raman, CV Raman, Indian Scientists, Nobel prize, Raman Effect, Scientists on November 7, 2014 by navayugbharati.